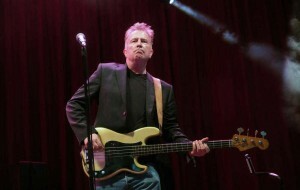 The legendary TRB singer and BBC 6Music radio presenter Tom Robinson recently played a short acoustic set at The Rainsbrook Conference Centre, Rugby (CV21 4PN). I provided the PA and the FOH mix and also provided stage lighting for the show. The benefit event also included performances from Lorna Dea (a couple of nights before she’d been on stage supporting Paloma Faith at the O2 arena!) and local young female group The Milenniums. There were also solo singers from Rugby Area Talent Trust or RATT. It was a thoroughly enjoyable night. The sold out audience were treated to a hit laden set from Tom Robinson including War Baby and several (slightly updated) songs from the TRB Power in the Darkness album which celebrates its 40th anniversary this year. Chris is available to provide PA and stage lighting services to small local events or gigs. "Recording is perfect. Excellent engineering yet again. Really good production. Thanks again for an excellent result. "Chris was an excellent coach for my first experience of providing a voice over for our corporate telephone system messages. His professionalism and attention to detail ensured the finished result was received by my colleagues with statements of “brilliant” , both “posh and professional”. I wouldn’t hesitate to recommend his services." "Chris offers great recording services and pays close attention to quality and detail. Also, our client really appreciated being able to monitor his recording sessions by phone." "Apart from being a very cool guy Chris' rates are excellent and he goes above and beyond. Because of the quality of his studio's output (and it's a very nice studio) I was listed with a great European VO site, and in the couple jobs I've done with him he willingly offers advice and direction and helps the work to come out much, much better. Easy to work with and a wealth of knowledge and experience being that he is also an accomplished voice over artist." "I cannot praise too highly the services of the studio run by Mr Chris Radley. He shows respect for the material, professional concern for the effects of the recording and responsibility for the comfort of both speaker and director. I would certainly use his facilities again"